Found in Kitomba 1, the Give to Client feature gives your clients the ability to enter their own details into their Client Card using any device. When using the Give to Client form Kitomba 1 goes into ‘client mode’. This means they’re only able to enter details into the form and the rest of Kitomba 1 is locked down, keeping your business and other client information safe. 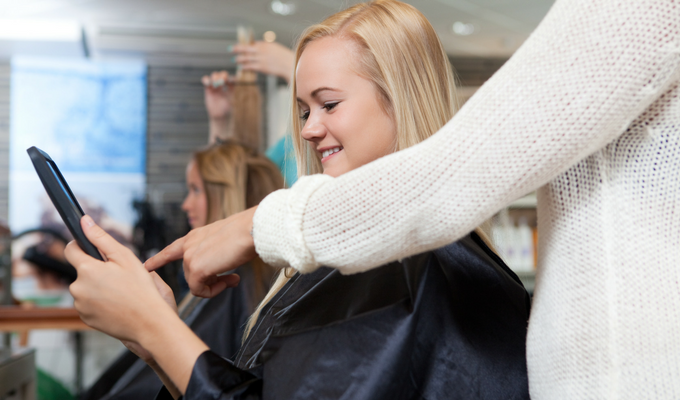 It’s the perfect tool for when new clients visit your salon. Save yourself hours of manual data entry and trying to decipher clients handwriting. Collect all your clients details. The more information you have, the better the service you can provide. Go paperless – the less paper we use the better! Show your clients you’ve got the latest and best technology. Save time and be efficient by getting your clients to enter their details during their appointment. Thinking of cleaning up your client data? Get your team to use the Give to Client feature during every appointment and in no time you’ll have up to date, correct Client Cards. 1. Go to the Kitomba 1 Clients tab. 5. Once your client saves the form, their details will automatically be added to or updated in their Client Card. Kitomba helps you organise the client information you need using Kitomba’s Client Cards. That’s why it’s totally up to you what information is collected. You can choose which details must be collected in the Client Card before it can be saved. For example, it may be vital to your business that you have their phone number so you can send them appointment reminders. Read our support guide to learn how to choose Client Card preferences. You can create custom attributes in Kitomba to collect the information you and your team needs to deliver personalised service! Like knowing a client’s occupation or beverage preference. Here’s how to add custom attributes to your Client Cards.